Nothing says "celebration" like serving prime rib. While this cut of beef can be pricey, the flavorful, juicy meal that it creates is well worth the cost. This prepping and cooking method is specifically designed for prime ribs that are less than 8 pounds. It is also calibrated to produce a perfect, medium-rare slice of beef. 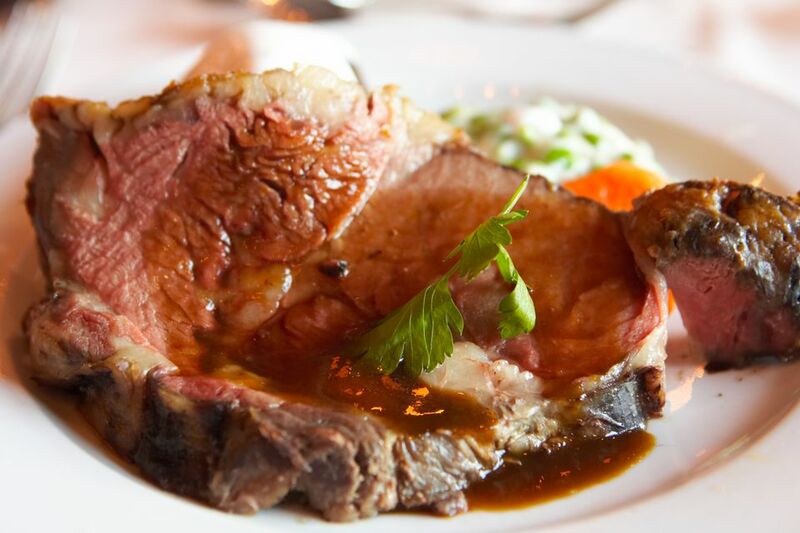 If you're doing a larger prime rib or want it cooked to a higher temperature, it may be done with the traditional method for prime rib of beef au jus instead. The equipment you will need include a heavy roasting pan, compound butter for seasoning, an oven, carving knife and cutting board. The roast you bought is probably trimmed for the oven, but if it still features a thick layer of fat on top, trim it off, leaving only a 1/4-inch to 1/2-inch layer. Place the prime rib in a heavy roasting pan and leave out for two to four hours, depending on the size, to come up to room temperature. This is a critical step—if the prime rib is ice-cold, the formula you use to cook the prime rib will not be accurate. To ensure a flavorful prime rib, make a simple compound butter. For every 4 pounds of prime rib, combine 1/4 cup soft butter, 1 teaspoon black pepper, 1 teaspoon salt, 1/2 teaspoon cayenne pepper, and 1 teaspoon herbs de Provence. You can also use olive oil instead of butter and any dried herbs that you like. Spread the soft butter mixture all over the surface of the prime rib and then season the top generously with more fresh black pepper and salt. Don't be shy when seasoning the prime rib before roasting. It's a big piece of meat, and the seasoning on the outside needs to be generous. To figure out how long to cook the prime rib, multiply the exact weight of the beef by 5 and round up to the nearest whole number. This is the cooking time in minutes. Preheat your oven to 500 F. Place the prime rib on the middle rack and roast for exactly the number of minutes determined by the formula above, then turn the oven off. Do not open the door of the oven. Wait for two hours with the oven turned off and the door still closed. Resist the temptation to check on the beef, as it will release heat from the oven. During this period, the heat from the initial searing will continue to slowly cook the beef to a perfect medium-rare. While this formula should work beautifully, you can always double-check with a thermometer at the end of the two hours. If the prime rib is undercooked, simply turn the oven to 325 F and cook until the internal temperature is 120 F. Remove from the oven, cover loosely with foil, and let the meat rest for 20 minutes. Remove the prime rib to a cutting board and slice it up. You can slice on the bone or trim the bones off the bottom of the roast and then slice the meat. The general rule of thumb is two portions of prime rib per bone in the roast. To make a quick natural sauce, pour off the excess fat from the pan and place it over high heat on the stove. Add 2 to 3 cups of water or beef broth and bring to a boil while scraping all the caramelized beef drippings from the bottom of the pan with a wooden spoon or whisk. Let this boil and reduce slightly while you slice the meat. Pour into a serving bowl, season with salt and fresh ground black pepper to taste, and serve alongside the prime rib.